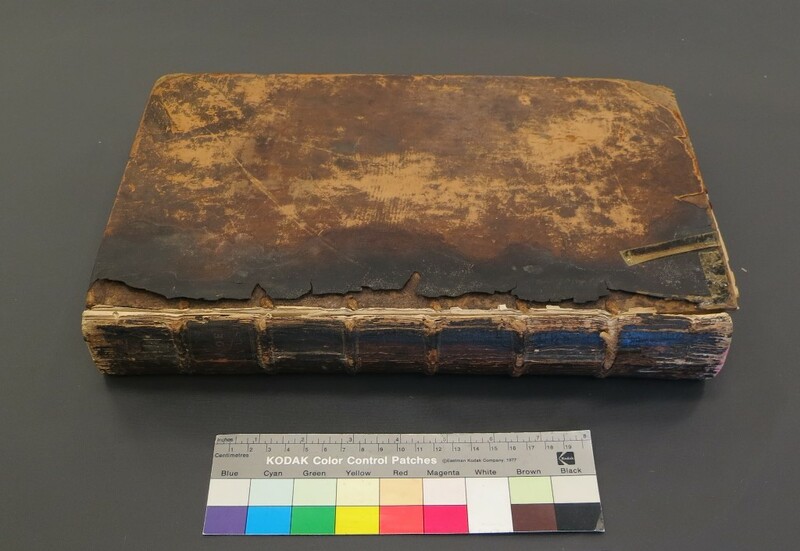 The book showed signs of fire and water damage. 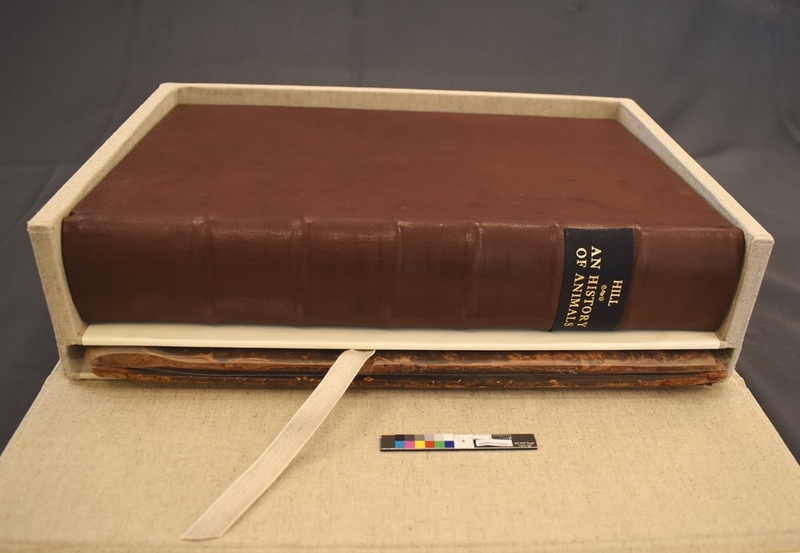 The leather on the cover was blackened and missing in large areas, including the spine. Owing to this damage, the remaining leather was very brittle. The boards were detached and the sewing of the textblock was broken. 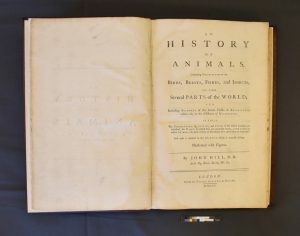 There were tide lines on the pages, evidence of previous water damage. It may sound counter intuitive, but in order to reduce the staining caused by water damage the best treatment is often re-immersion in water. Washing paper can remove soluble impurities but when paper is only partially wet those impurities don’t wash away but pool and form stains or tide lines. 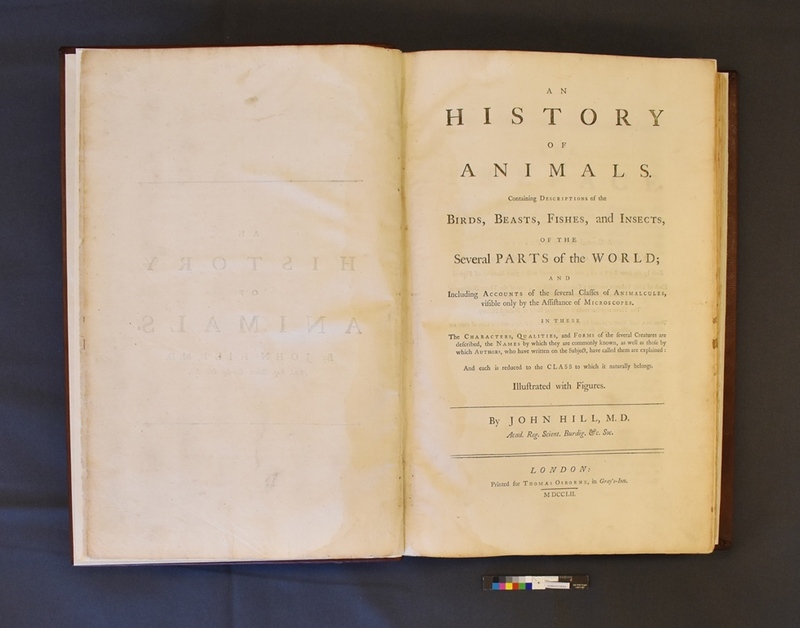 In the case of this book, the sewing was removed and the pages separated into sections. 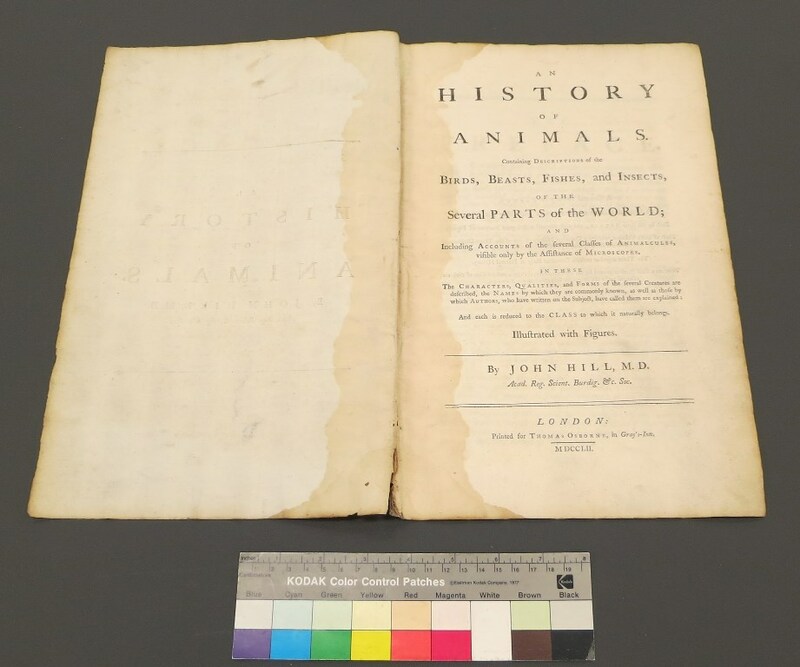 Each section was then washed in de-ionized water resulting in brighter paper and reduced staining. After carefully drying the wet pages and pressing the pages between blotters and felts, the pages of the book were re-assembled and re-sewn. 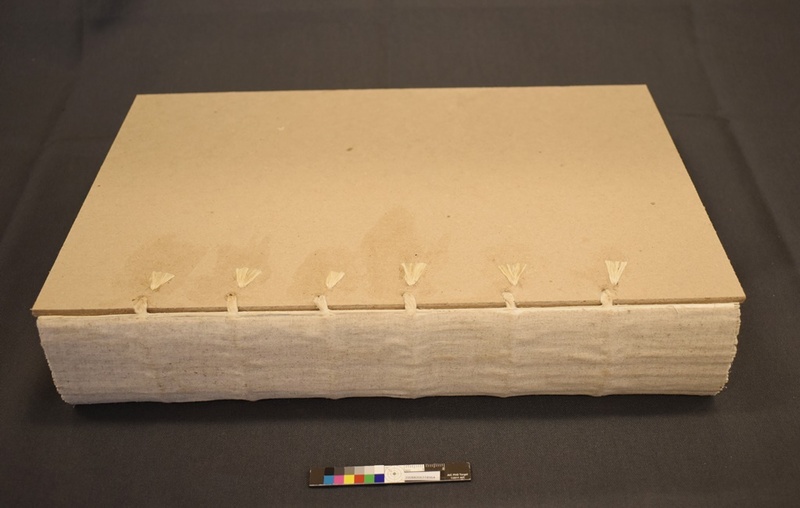 The folds of each section had to be re-enforced with a Japanese paper guard to add strength for the sewing process. The original sewing holes and structure was replicated in the re-sewing of the textblock. 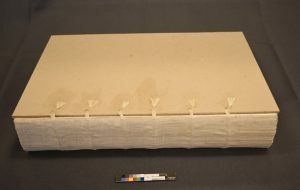 To reduce swelling caused by the guarding a two-on sewing was used in which two sections are sewn on one length of linen thread. Once an appropriate skin was located the volume was re-covered. 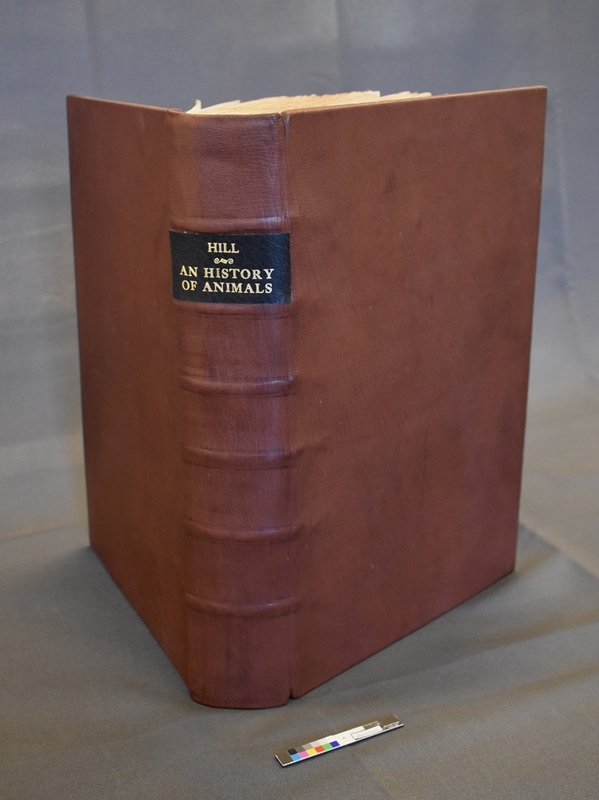 The original binding showed no signs of gold tooling or blind stamping so the new cover was not decorated. 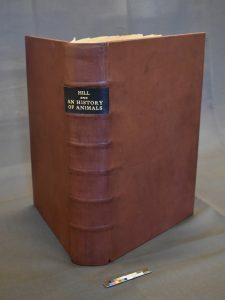 The original spine was missing so we were unsure of the original information for a label. So a simple label was stamped in gold and placed on the spine. The original covers were retained. 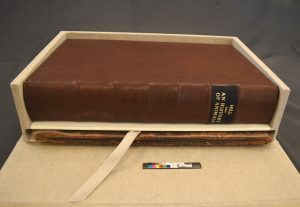 A double tray box with an extra tray for the original covers was created so that the re-binding and the parts of the original binding are housed together for the use of future researchers. The complications in finding a leather that approximated the original led to intense study of the leather tanning process by our conservators that will be shared at a conference in May of 2018. Previous Post Happy Holidays from Smithsonian Libraries! Hi Katie! Great write up. Looking forward to hearing about the tanning study. Thank you, very nice work! Many sophisticated procedures + accuracy! What did you do with book headband: unplait – resew?